Are modern superbikes simply too slow for your taste? Do you want a turnkey track weapon with more bling than an NBA superstar? 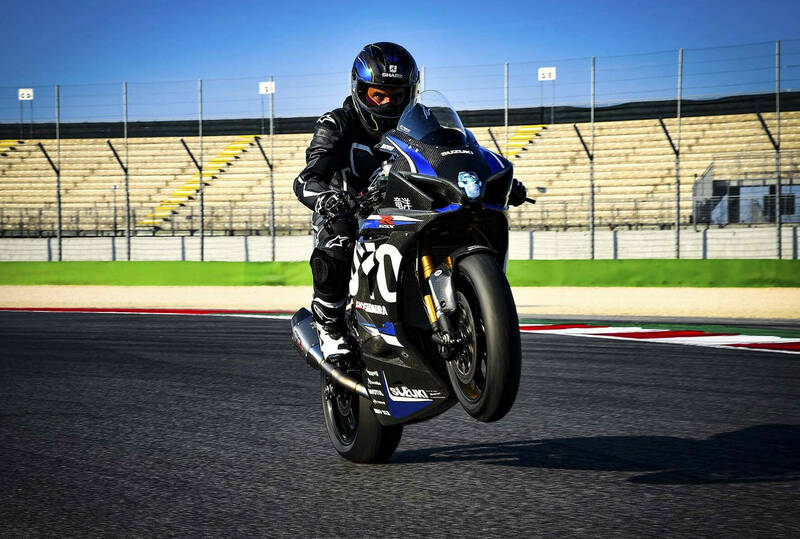 Better get in line quick, because Suzuki Italy is only building 20 GSX-R1000 Ryuyo bikes. By the way, Ryuyo refers to the facility in Japan where Suzuki tests its new sport bikes, and you better have the equivalent of 30,000 Euro sitting around. 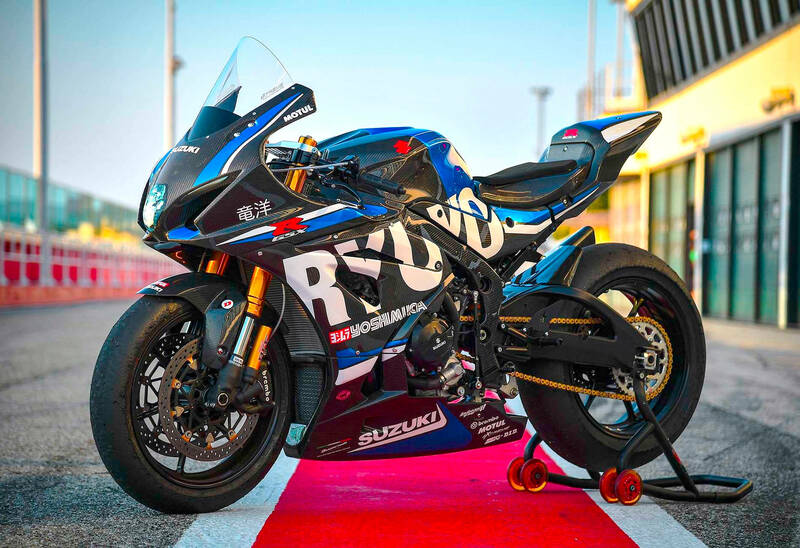 You can follow this link to the GSX-R1000 Ryuyo Italian web site (Google Chrome provides a nice translation) and begin drooling over the one-off carbon fiber parts, together with top-shelf Brembo, Öhlins, Yoshimura and other aftermarket finery. I wonder if that is lie weight, fifty pounds less than stock, or weight, one hundred pounds less than stock. This industry has a severe credabilty problem. If that carbon fiber frame is real, and not just a wrap, then maybe it is a lot lighter. More than likely it’s just a claimed dry weight. Thanks to MD for the full resolution photos you can zoom and see it’s a carbon cover on the frame. I was marveling at how smooth the weld was on that carbon fiber..
Just ordered mine. I’ll have it delivered to the villa in Nice. I think they are referring to the name of the bike, not the track shown in the pictures. Good to see a double bubble screen fitted. The Factory would never have the foresight to fit it. I would require one other accessory to purchase this: A throttle stop that would limit its travel to somewhere between 25-50% open, especially for street use. Way beyond my humble capabilities, but one has to admire the engineering. If someone had Leno-money, it would make a great conversation piece in the three-level garage. Finally, a bike that will make me a faster rider. It may not make you a faster rider, but you’d be faster on this bike. There’s a particular road near me that I commute through twice daily. It’s 10-1/2 miles and has 120 turns or something (long time since I last counted). It’s a nice empty run through the redwoods. So far my best time was 11-1/2 minutes on a ‘82 Seca 650. I’ve timed myself with many different bikes from my Ducati 900 and a ST4, a Ninja 250, 650 and 1100, different enduros, my GB500, SV650 and some scooters. The second fastest time I got was on my K75S at just under 12 minutes. I usually ride towards the front when on group rides and I’ve come to understand that the rider is the limitation when riding, not the bike. I don’t think I could match my Seca time through that road on this Suzuki, in fact I bet I’d be slower just like I was on all those other bikes. Usually what holds my corner speeds down is not tires or suspension or power but the fear of what would happen to me or the bike if I screw up. I wasn’t too scared about dropping the Seca and that translated to higher speeds. I imagine there are people who could ride my Seca even faster through there but I don’t think I could ride any other bike faster. Is the road in Marin County, CA, intersecting Highway 101 S-bound, just N of San Rafael? Naw, in the East Bay. Redwood Road. Seriously, that is a sweet bike, would love to have the time for that kind of toy!! That actually seems like a deal with the level of components and fiber on this thing… 30,000 Euro is about 35k in USA coin? Tank seam. No beak. Seat too high. 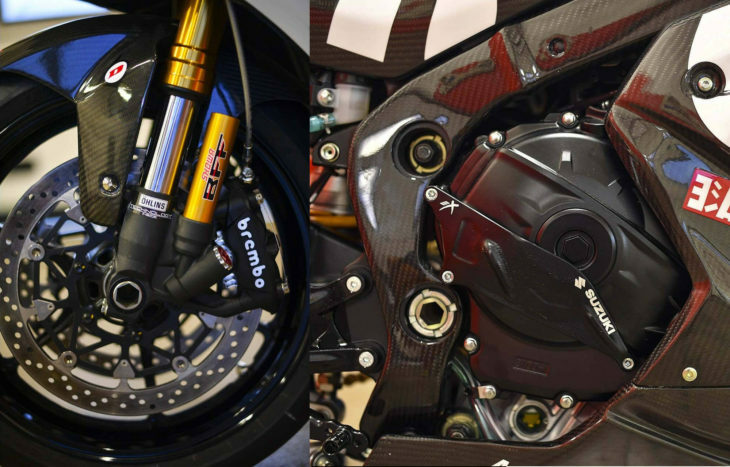 In all seriousness, how much does it cost to build a competitive race superbike? This might actually be a bargain in that respect. You can spend a LOT of money. $10k-$20k for the base cycle… Add engine internals or change internal gearing if you have support for it (ZX-10RR has a kit for the engine part…), another $10k. For top-end suspension, $5000 per end. Full-up race brake calipers… $4000 or so. Titanium Yosh race exhaust… $3000-$5000, depending on the model. Maybe more. Seems like 30k Euro would be about $45,000, wouldn’t it? I don’t think it’s out of line at all with what a “homebuilt” race bike would cost. It doesn’t look like this has quite the level of insanity that something like the Aprilia RSV4 FW has, but it would still be a great club-racing bike for someone with a ton of money, but not a TON of money! I have over $20k into my supersport race bike (Triumph 675R) and I haven’t touched the engine internals. A lot guys club racing superbikes drop close to $30k on their bikes and they still have to sort everything out in the end. This seems like a pretty decent deal… but I have no idea why it has a bloody headlight!?! The headlight? That’s so you can flash all of those poor schmucks out of the way as you blow by their poorly sorted bikes. Nice, Yoshimura USA should build a few for us “Yankies”. It shows what’s available when “big brother” government is not involved. Lightweight bolt-ons, proper fuel injection tuning. 30 grand, still priced less than a 2019 Ducati V-4 or a Panigale R’. You’re comparing a special construction bike (with 20 units to be built) to mass produced bikes and think the government is to blame for the difference. Wow! I’m sure Suzuki would be banging these things out if not for the evil empire…..
Just because you are paranoid doesn’t mean they are not after you…..
You must have mis-read my comment. Sounds like JPJ is the paranoid one. Note that quoted prices in Europe (almost always) include value-added tax at normal rate of 17 to 27 % depending on the country. Italy is at 22 %. US prices are generally tax-free. Nice power to weight ratio. This is what it means ‘ to fly ‘.